One of the most beautiful and elusive cats in the world, the snow leopard lives only in the snowy mountains of central Asia. Though the snow leopard is considered a "Big Cat", it is noticeably smaller than the other big cats with the average male only weighing about 50 kg. Solitary hunters, the snow leopard ambushes its prey aided by the camouflage of its light colored fur with dark rosettes. Prey ranges from gamebirds and hares to sheep and domestic livestock. In the wild, the snow leopard faces competition from only one species: man. Hunted for their remarkable coats and killed to protect livestock, the snow leopard, like all big cats, is facing the threat of extinction. The snow leopard has a much longer tail in comparison to its body length than other cats. This serves to help balance the snow leopard on the steep inclines of its mountainside home can leap up to 50 feet to high rocky crags.The Tail can be wrapped all the way around the body and across the face like a muffler. The coat of the snow leopard has dark or black rosettes on a background of white, cream, or light grey colored fur. The underbelly tends to be lighter colored. The head is spotted in rows, and the ears are often ringed in black. This coat of long, thick fur and its very long tail are essential to the snow leopard's survival in the extreme cold of the central Asian winters.Paws are thick cushions of hair protect the large paws from heat and cold, and provides a better traction in the snow. In addition, against the snow and rock-covered mountainside, the irregular patterns of the snow leopard's coat make for an exceptional camouflage.The snow leopard sheds its coat annually growing a thicker, lighter colored coat in winter and a shorter, darker coat during the summer. The snow leopard also has the physical attributes common to all the big cats: retractable claws, a rough tongue to remove fur and skin from prey, large canines to seize and throttle its prey, forward facing eyes with excellent night vision, and loose belly skin to protect against the kicking of larger prey. 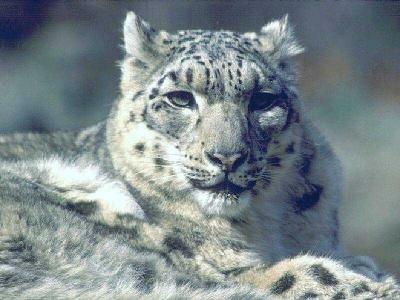 It should be noted that the snow leopard is not as closely related as the other big cats (tiger, lion, leopard, jaguar). The snow leopard is sometimes classified as Uncia uncia to distinguish it from the other members of Genus Panthera. 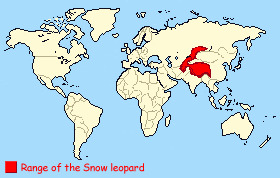 Snow leopard home ranges include areas in the Altai Mts. (former Soviet Union & Mongolia), the Hindu Kush Mts. (Afghanistan) and sections of the Himalayas (Western China & Tibet). The snow leopard spends most of its life at altitudes above 5,000 feet and possibly as much as 18,000 feet. They generally remain above the treeline and below the permanent snow line in search of their prey. During the winter, the cats may descend lower in search of prey and warmer temperatures. In order to get enough oxygen into its bloodstream at these high altitudes, the snow leopard has evolved smaller, more numerous red blood cells. Because of this harsh climate and the elusive, shy nature of the snow leopard field research on these cats is very difficult and, in comparison to the other large cats, very limited. Snow leopards are solitary cats, coming together only to mate. Individual territories may be as large as 40 km2 with a small central region that is most heavily hunted. For snow leopards, there is generally much more overlap between the territories of males and females than for other big cats. One reason for this is the inclines of the mountains increase the available range. Like the common leopard, the snow leopard hunts through stealth and cunning rather than chases over a long distance. They approach slowly or lie in wait until their target is only a short rush or leap away. The snow leopard is a particularly powerful leaper, pouncing on its victim from distances of up to 15 meters. Occasionally, snow leopards will drop from above onto their victim. Snow leopards prefer hunting at dawn or dusk (though they are also active at night) and they are capable of bringing down animals up to three times their own body weight. Snow leopards are opportunistic predators and make meals out of a wide variety of prey: blue sheep, Asian ibex, musk deer, hares, boars, marmots, pikas, ground-dwelling birds, small yaks, goats, and domestic livestock. A snow leopard needs to bring down about 20 to 30 blue sheep a year to survive. From a single carcass, the cat can feed for several days, the cold environment preventing the meat from spoiling. Snow leopards have no competition from other large predators and so do not have the same trouble protecting a kill as other big cats. A rare exception to this is the very adaptable leopard which sometimes hunts within the lower altitudes of snow leopard ranges. The snow leopard mating season is from January through March with a gestation period of 13 to 15 weeks. Females give birth to 1 to 5 cubs which are born blind. The cubs are raised only by their mother and will remain with her through their first winter.At Birth they weigh in at 320 - 567 grames.During the following year they will depart to establish their own territories. Snow leopards do not become sexually mature until about three years of age and fully grown at age four. Females typically go two years between litters. In captivity, snow leopards may live to about 15 years of age. There are an estimated 3,500 to 6,500 snow leopards remaining in the wild, and more than 600 - 700 are in zoos in the United States. The biggest threats to the snow leopard's survival are loss of habitat and slaughter by man. Snow leopards are officially listed as an endangered species and commercial trade is outlawed by international treaty, but there remains a market for their beautiful furs as well as their bones (to be used in traditional Asian medicine). Another serious problem besides poaching are the snow leopards killed by herdsmen. Most of these herdsmen are extremely poor and the loss of a single animal is a significant one. Recent programs have begun which provide incentives (such as food or clothing) for these people in return for protecting rather than competing with the rare cats. Research and conservation efforts on the snow leopard are led by The International Snow Leopard Trust. Selective breeding programs have been established by the Species Survival Plan in order to maintain a solid captive population of snow leopards in the United States and to minimize the detrimental effects of inbreeding. The snow leopard is slightly smaller then the leopard, but it`s dense fur makes it look larger. Hunting kills most snow leopards, but avalanches account for man fatalities. Compared to other cats, the snow leopard`s tail is longer in proportion to the actual size of its body.